When I moved here, like the heroes of Midnight in Paris, I was hoping to find a spirit of the decadence and glamour of the 20ies. The first time I actually found it was when I saw Sucre d’Orge was in Carmen. I was mesmerized. And now, I got a chance to meet her and talk a bit about her inspiration. Sucre d’Orge is a beautiful performer of French burlesque. Her style is refined and teasing. When asked about how she started in burlesque she smiles seductively and talks about her first number: a doll that comes to life. The number was a success and a new star was born. Her signature numbers include “Marie Antoinette” that features a fantastic corset hand-made by a Parisian corsetiere and “Pink Flamingo” with enormous feathered fans. I was also happy to find out that Sucre d’Orge has two Russian numbers that serve as homage to her Russian roots that go back to a great grandfather. We had a little shooting done with my favorite Comtesse Sofia scarves to accentuate the Russian side of this charming Frenchie! Playful and mysterious, Sucre d’Orge is a true artist. She confirms that she is inspired by silent movies and ballet. Very chic, very French, very Parisian. Some call her “Paris best kept secret” but I think I just gave it away! You can see Sucre d’Orge perform at Rasputin and selected clubs in Paris. Follow her FB page or her blog for info on her upcoming shows. Vika Gazinskaya new look book posted on Buro 247! embroidery and romance. the dress is by Natasha Zinko and i have to do a post on this very talented designer soon! voila! this was just to admire this adorable young woman, russian fashionista #1, someone who knows how to have fun with her clothes. beautiful, simple, complex and always radiating a sense of ‘niceness’ around her – Mira Duma, ladies and gentlemen! I think everyone is a “bit” sick of the cold… Paris has seen it all this winter: rain, snow, Seine flooding, more rain and more snow! so i am more than ready for spring now! but spring does not always come with an instant temperature increase. 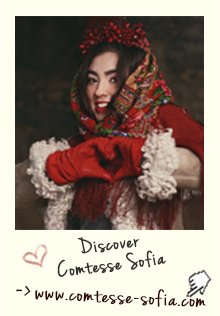 This is why i am in love with the new collection of Comtesse Sofia spring scarves and summer shawls. I also love the new campaign – a beautiful countess who finds herself in a bohemian artist’s workshop… romance and love is in the air – as it should be in spring! Ulyana Sergeenko Paris Fashion Week: GUESTS!!! post-Fashion week: Buro 247 Mira Duma and Ulyana Sergeenko celebrating! new home: Paris, Ile St Louis.